In the history of Kenya sports, there was only one occasion when the game of tennis captured the imagination and attention of the Kenyan public. That was during the early 1990s when Paul Wekesa featured in Kenya’s Davis Cup team. He led Kenya to unprecedented success in the Euro-African zone of the Davis cup. Paul Wekesa was born in Nairobi on July 2 1967. He went to the USA on a tennis scholarship where he played for Chapman University. In 1987 he became NCAA division 2 doubles champion. That same year, Wekesa returned to Kenya to play in the 4th All Africa games. He reached the semi-finals and won the bronze medal. Wekesa won three ATP tour doubles and finished runners up three times. His best year was 1995, That year he ranked in the top 100 players in the world. To this day, he is the only Kenyan to achieve that feat. He played in all four grand slams and reached the quarter finals of the Australian open. However 1992 was the year to remember as far as Kenya tennis fans are concerned. That year Kenya advanced deep into the Euro Africa zone of the Davis cup. Most notable was the win over Romania. Wekesa and Eno Polo won their singles matches then teamed up to win their double match, thus beating Romania 3-2.Prior to beating Romania, Wekesa had led Kenya to wins over African giants such as Cote’d Ivoire whom they beat 4-1 and Nigeria whom Kenya beat 3-2. The excitemenent of advancing through each stage of the Davis cup caused a tennis-mania in Kenya. 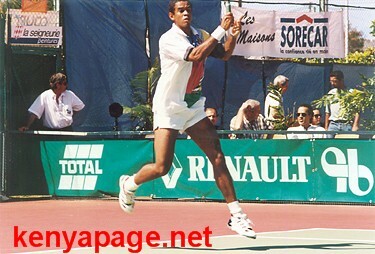 Wekesa continued to play in the Davis Cup until 1998 when he finally hung up his racket. He later became Kenya coach. In 2007 he won the hall of fame category at the Kenya sports personality of the year awards. i salutes him for the spetecular performance in tennis! i used to believe tennis is only for smart guys from western countries. he proved that sports is not limited to only few people but rather it is for the talanted people who practise smartly. how i wish he mentors other kenyans to embrace sporting particularly tennis as the alternative full time career.